1. Use a spiraliser or shredding tool (such as the shredding attachment on a food processor) to shred the beetroot, or grate it using the coarse side of a box grater. 2 .Melt the butter in a large frying pan over a medium heat. When it sizzles, add the beetroot and sauté for 1 minute. Stir in the horseradish and continue to cook for 2 minutes. Season and add the vinegar. Cook for 1 minute more, then remove from the heat. Stir in most of the dill. 3. 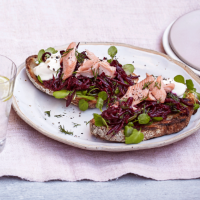 Butter the toast, if liked, and top with a few watercress sprigs, followed by a generous tangle of beetroot and half a flaked trout fillet. Garnish with a little more dill, plenty of black pepper and a spoonful of the soured cream or crème fraîche on the side.